Less sportsboat, more Gran Turismo, the Axopar 28 Cabin opens up a world of possibilities for extended voyages and longer average journey times and with the Aft Cabin option, this is our biggest selling model so far. Boating people know the weather can be an unpredictable force and being caught out in a rain storm, or being buffeted by strong wind for hours on end can be tiring. With capability of seating up to five people within a bright and airy, full weather protected environment, there’s ample incentive for an owner and guests to spend not just a few hours onboard, but several days and even weeks enjoying their Axopar Cabin version to the full. The cabin does offer occasional sleeping possibilities for one or two, but customers find the Aft Cabin option is an even better solution for genuinely comfortable, dedicated overnight stays and drop-of-the-hat weekends away will soon become your boating norm. 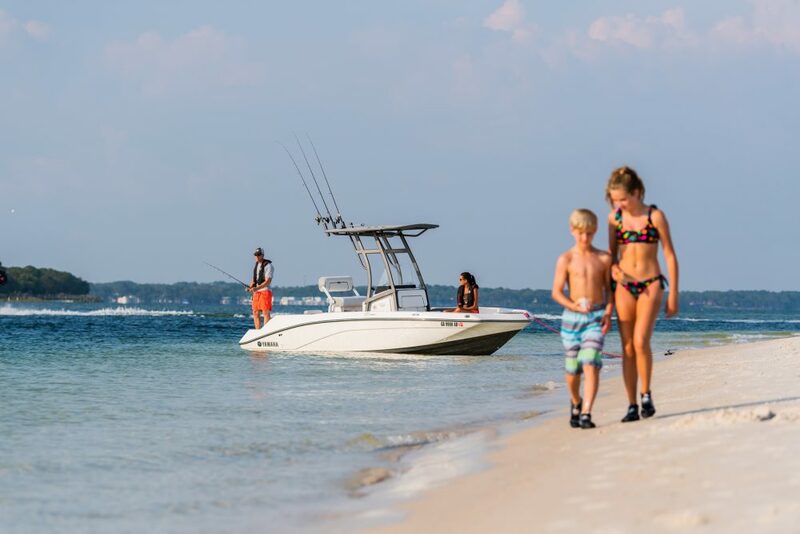 Versatile by design, the walkaround side access and aft-deck in standard form is a large, flat and practical space that works well as a home for fishing, or water-sports activities and such-like. As with other models across our range, the aft-deck can be configured either with, or without, an additional rear-facing bench seat and storage box, or for all-day hospitality, our dedicated drinks serving area and wet-bar module option is a must. Go further and stay out longer with the Axopar Cabin. 130mm added length and 50mm added width, raised hull sides by 80mm, softened spray rails and rounded keel shape. New stringer system based on 37 range. Improved shape and water deflection on bow thruster flanges. Vinylester resin for the first coat of the hull in GRP material, New anti-skid pattern on deck and deck hatches, enlarged service hatch on fore deck, Revised large bumper list with improved cushioning in grey color, Wraparound windscreen and side windows in toughened 6mm glass and tinted light green with optional illuminated 28 designation, Pulpit and cockpit handles in hand polished stainless steel, 6* Stainless steel cleats aft, mid and bow, Fender storage on aft Deck SB and Port sides, Widened bathing platform with integrated Esthec Platinum decking with and telescopic bathing ladder, Self-draining deck with large diameter scuppers, Integrated engine bracket for outboard engines. Axopar 3D lettering on hull sides and model designation on side glasses. Soft Touch painted dashboard and console panel, helm panel with passenger side grab rail, Illuminated push buttons and Axopar logo on glass panel, high-gloss helm exclusively in conjunction with factory-installed GPS and Mercury Pre-rig, Leather steering wheel with Axopar logo, 2 x cup holders, 12V power outlet, Compass, Fabric document pocket on console wall, Walnut foot rest. Walk-around deck with sociable reshaped L-sofa on foredeck and open aft deck area with enlarged storage under deck with integrated locker for windlass / bow thruster battery, Lowered floor level in cockpit for driving while standing, Driver and co-pilot seats with flip-up front / swivel function and outer armrests, Storage locker under co-pilot seat, ”Silvertex” Taupe, Graphite, Sterling and Cobre material on driver/co-pilot seats and aft sofa. Aluminium fuel tank 300l (/240 EPA)l, 2 kg fire extinguisher, Manual bilge pump, Harbor cover for canvas roof, Flagpole. Below are examples of some of the features that can be found on the models in the 28 range. 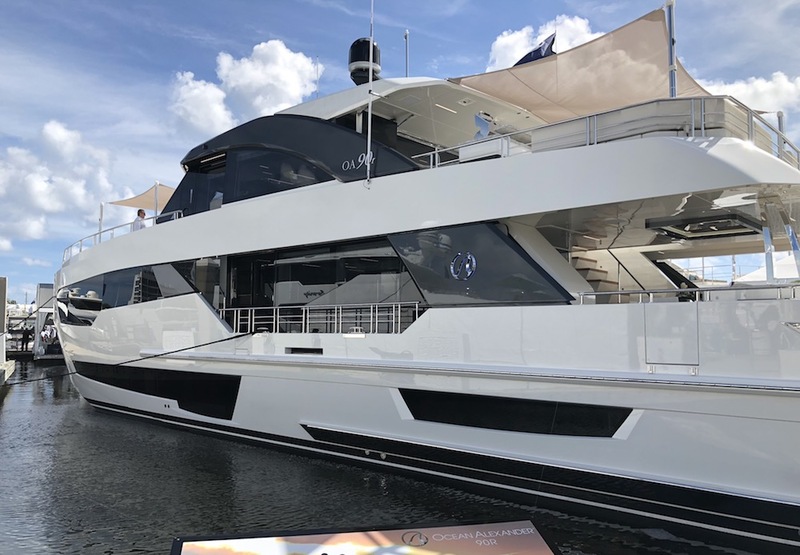 The spacious aft deck features a large storage hatch in the floor and offers lots of possibilities for fishing, water sports and other activities. The aft deck can be equipped with an optional bench / storage box, a wet bar module or an aft cabin. The bright and roomy aft cabin comfortably sleeps two persons and has indirect lighting in the wall panels and two reading lights + storage space under the mattress. Optional cushions are available for a comfortable sun deck on top of the optional aft cabin. Large functional compartment accessed from the foredeck with optional toilet. 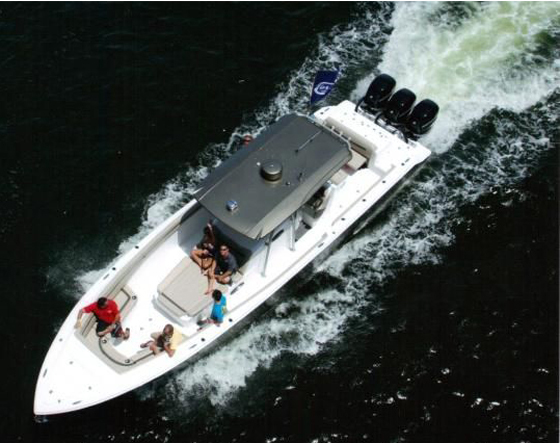 Features storage space with railings keeping bags and other gear in place and an optional faucet and sink is also available when equipping the boat with freshwater. The huge sliding canvas roof lets you enjoy warm summer days inside the pilothouse and also provides excellent soundproofing by absorbing noise and reducing echoes when closed. The roof can be equipped with an optional targa arch with roof rails. A harbour cover for the canvas roof serves as additional protection for the canvas roof against UV rays and bird droppings. 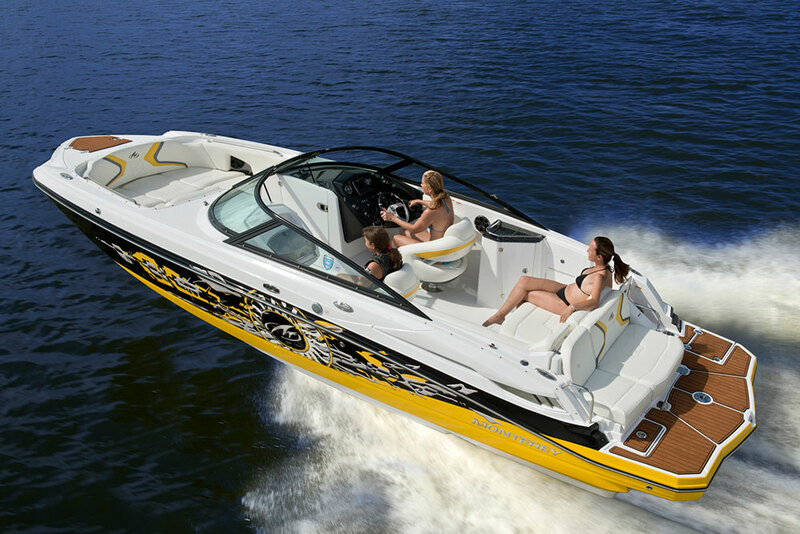 All 28 models feature a walk-around deck for easy handling and access. 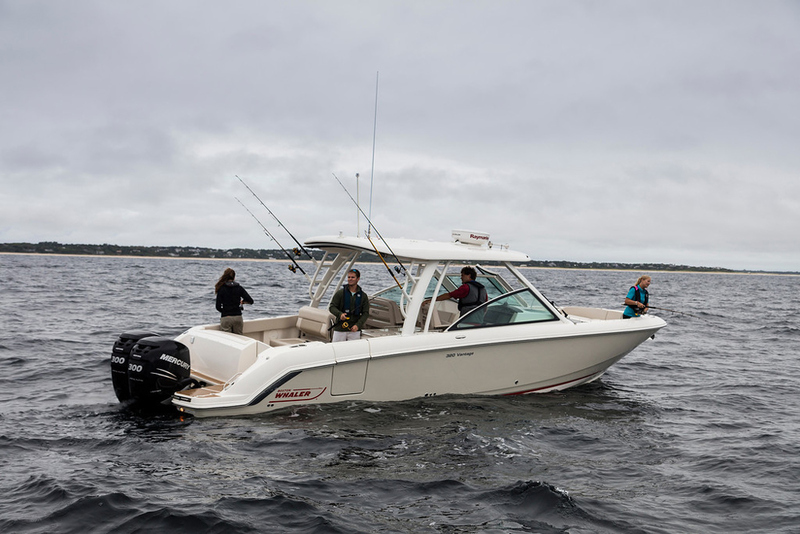 All models can also be equipped with optional side rails around the entire boat. The reliability, flexibility, long warranties and service intervals make an outboard engine the perfect choice. The specially developed Axopar hull utilizes the outboard engines' maximum potential. Performance may vary due to equipment, weather and load conditions. All Axopar 28 models can be ordered with BRABUS Line options. standard specification Axopar by ordering from our BRABUS Line options, adding value with discreet interior & exterior trim & styling enhancements. Sample a taste of BRABUS Marine refinement by selecting the BRABUS Line Trim Package, which includes: Black rub rail, Suede steering wheel with "doubleB"® logo, Exterior black-painted stainless steel parts, Suede co-pilot grab rail with BRABUS logo, Black cleats with "doubleB"® logo, New design Axopar seats, Axopar BRABUS Line hull signature, Niroxx upholstery with diamond stitching, Axopar model plaque in carbon fibre. BRABUS Line Color Edition: The BRABUS Line Trim Package can be further enhanced by selecting one of our two exciting new hull, deck & roof colors: Choose from vibrant and playful Miami Blue, or a more discreet Platinum Grey. BRABUS Line Premium Package: If you are ordering a 28 Open, T-Top or Sun-Top with BRABUS Line Trim Package, and you want to make an even greater styling impact, our BRABUS Line Premium Package includes super-cool Baltic Blue cushion upholstery throughout, front deck seat cushions, table, harbor cover, and mooring kit.